Used primarily to separate rocks and large debris from soil and sand, Cat Skeleton Buckets feature heavy-duty construction and find application in a number of industries, including agriculture, construction, land clearing, demolition, landscaping, and scrap handling. 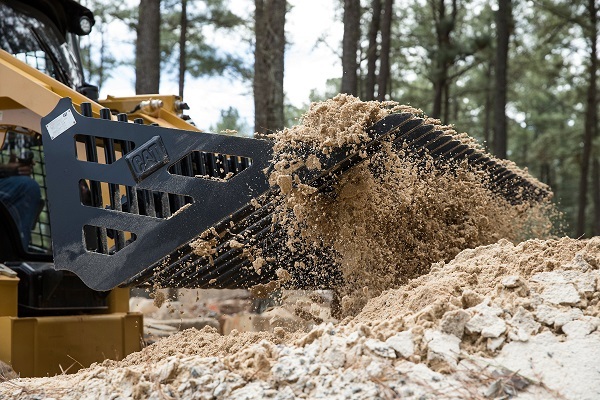 Designed for use with skid steer loaders, multi-terrain loaders, compact track loaders, and compact wheel loaders, Cat Skeleton Buckets incorporate a number of structural elements that ensure efficient operation and long-term durability. In basic construction, Cat Skeleton Buckets use heavy steel rods, 1.25 in. in diameter on 3.75-in. centers, to form the floor and back of the bucket. Thick plates with rectangular openings form the sides of the bucket, and a rectangular frame, fabricated of heavy duty steel and incorporating two steel plate rock dams, strengthens the back of the bucket. The rock dams serve to retain material, reducing spillage and increasing production.